This is...odd. Moon Knight isn't just hearing the voices of Spider-Man, Wolverine, and Captain America in his head. He likes to act like them too. So we get some pages of Moon Knight dressed as Spider-Man delivering purposely terrible (I think) one-liners and fighting some toughs. Then he pops some claws out of a contraption on his arm when he, "becomes," Wolverine. Okay? Is Bendis doing a clever meta-commentary with a hero who has run out of ideas so he is poorly imitating other heroes like Spider-Man and Wolverine? If so, that is genius. I think this is just Bendis doing a, "Moon Knight is so crazy!" storyline though, unfortunately, so hrm. 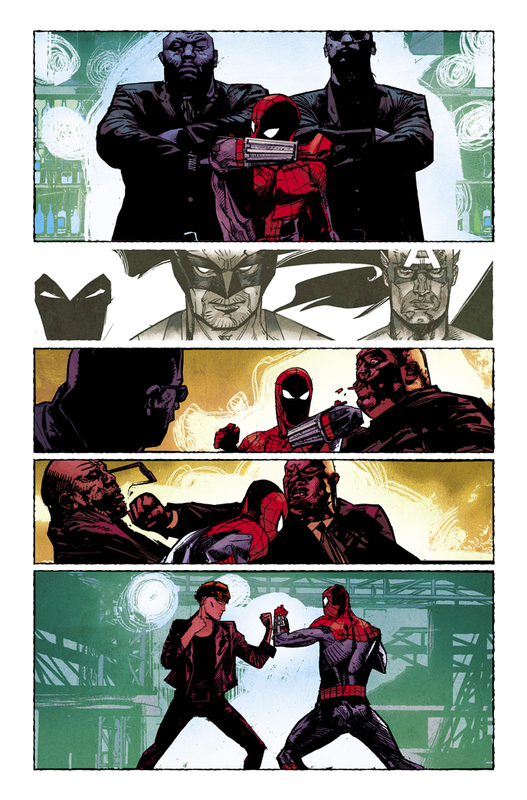 The art by Alex Maleev is great, with a nice scratchy style, and this mysterious new kingpin character has piqued my interest. I'm just so thrown by this whole, "dressing up as other heroes," thing and whether I am supposed to find it funny, take it seriously, or what. Moon Knight dressed as Spider-Man. Alright. This is a good issue in the sense of advancing plot points, providing some good dialogue, and having great art, but I'm just finding this element of costume-dressing weird and don't know how to take it. Still, a fun issue and I do really love Moon Knight...even if this issue was moreso Spider-Man as interpreted by Moon Knight.